When Daniel and I first discussed this project, I had today penciled on my calendar before even knowing if #4 would be my pick. The closer we get to real baseball, the more I felt the need to approach some of these posts more as a writer and less like a fan. There is so much history attached to the Cardinals that needs to be brought back into the spotlight, and that is where the idea for this site started to take shape. No time like the present to jump right into the St. Louis stars of yesteryear with today’s number. That famous picture has always caught my attention, and it was good that a large part of it between two Hall of Famers was rewarded last year. 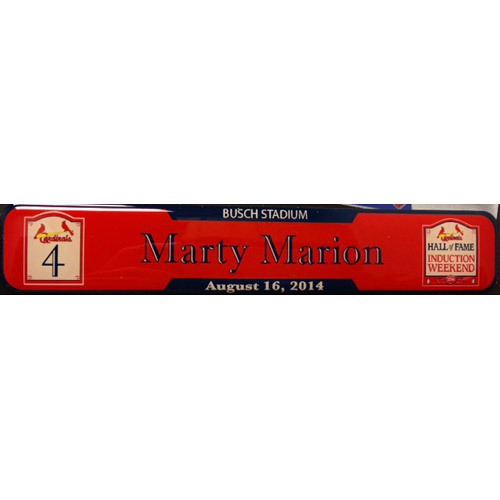 Marion was the National League MVP in 1944 in what must have been an amazing scene for the city under the Arch. The Cardinals knocked out the crosstown Browns in six games to capture a second title in three consecutive World Series appearances. Marion and company returned to the postseason two years later, again setting the stage for more October magic. 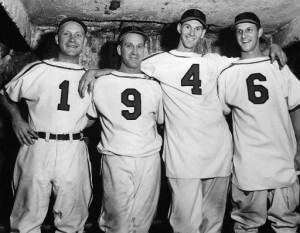 Game four of the ’46 World Series was one of those ‘must-wins’ for St. Louis, made all the more difficult by playing in Fenway. Boston was ahead 2-1 in the series, but the visiting shortstop and his running mates would not be denied. Marion drove in thee runs as the Birds on the Bat pounded out 20 hits to go with 12 runs and took the title in seven. As impressive as that decade was for the franchise, one other quality about Marion pairs him with the current occupant of the #4 jersey. The leadership displayed on the field by the shortstop took him from an All-Star in 1950 to managing the next campaign. 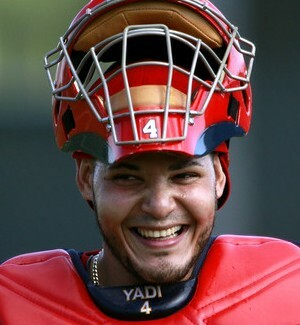 Could the same be in Molina’s future when it is all said and done? One thing I do know for certain is no one will wear the number again after Yadi’s ready to hang up his spikes, giving the Cardinals two Hall of Famers with the same tenacity and winning tradition. And knowing just how much St. Louis honors its players, I would not be shocked to see a pair of 4’s on the outfield wall at Busch. Before we get to that point, however, it would irresponsible of me to not give our female readers my own birthday present. Only a few more days to go and hope everyone is ready for the six month voyage we are about to take!